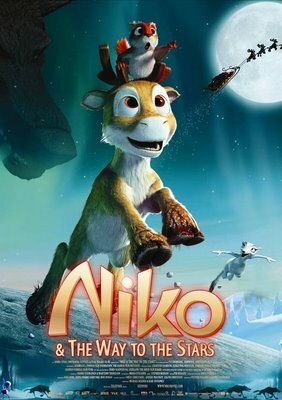 On Christmas Eve, young reindeer Niko’s world seems shattered after his mother remarries and he’s blamed when his new stepbrother is kidnapped. I don’t even… Reindeer drama? What? How could we not watch this? It turns out that the eponymous Niko can fly because his real dad is Prancer. Prancer. Do you get what that means? One of Santa’s magical caribou couldn’t make his reindeer marriage work, and is now an every-other-weekend dad. I can’t get over how starkly…modern that notion is given the context of a kids’ Christmas story about flying reindeer. 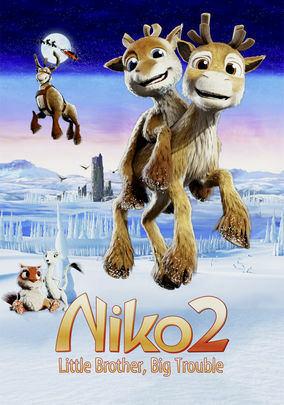 And the giant “2” on the cover tells us there was a movie before this one – was it about little Niko suffering through his parents’ (one of whom, once again, is Prancer!) messy reindeer divorce? I like to imagine so. The movie begins with Niko returning home from a visit with his dad to find that his mother has shacked up with her new cari-beau (…O.K., that was awful). If that weren’t enough to dump in a kid’s lap overnight, the new guy has a younger son of his own, and mom is already pregnant with another. Yet this isn’t even a wicked stepparent thing – the stepdad is a really nice guy. 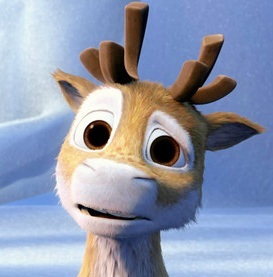 Am I seriously watching a mature portrayal of split-family dynamics in a reindeer cartoon? Niko himself is grudgingly adorable (even with his strangely reptilian nose). You’d think, being the only flying reindeer in his herd, that he’d be a typical acceptance-craving misfit protagonist. But, no. Enjoying solitude, he envies the life of a hermit he meets, and actually utters, in chipper earnest, “I wish that nobody knew I existed.” Yikes! The central conflict is mostly forgettable (aside from its own strangeness), involving a wolf who for some reason lives in a high mountain cavern with a bunch of eagles who for some reason carry her around and are her devout servants. This wolf, we learn, wants revenge on Niko for apparently having killed her brother in the first film (I presume as a way to lash out against his parents’ split-up). The film is Finnish, and while the visuals were expectedly not on par with the Pixar/Dreamworks standard, I’d place them only one tier down. There was some interesting detail (the reindeer, while still hyper-cute-ified, looked more like actual caribou than any other animated reindeer I can think of), the wingless flight physics were oddly amusing, and the mouth-sync looked to be re-rendered for the English dub. No one could seem to agree on how to pronounce the names, though. I’m not sure where I’m going with all this; I suppose I just enjoy incredulity. So should you watch this thing? I don’t know. But yes, you probably should. I feel like it takes place in a world where humanity has disappeared, but the reindeer have taken over running Santa’s shop because they don’t know any other way of life. When you finally do see Santa, he is wearing a starry-night cape. There is an ermine (not a particularly endearing ermine, but an ermine nonetheless). For some reason, Niko learns how to go starship-style warp-speed at the end. All of this is about an animated kids’ magical flying talking Christmas reindeer movie that was actually made, and exists, here on Earth, in this reality.